In the heating chamber vacuum furnace to form a magnesium-containing atmosphere to protect the exposed aluminum surface is no longer oxidation. On the other hand penetrate through an alumina film slit aluminum surface, forming alloy partially melted, further tunneling oxide film. Produce liquid solder wetting and flow on non-fresh surface oxide film, and filled weld formed under the action of capillary forces the fillet. Aluminum vacuum brazing must be seen in a high vacuum state by the above description, generally in 10-3Pa magnitude. If the vacuum of less than 10-3Pa, then immediately combined with magnesium and evaporated vacuum brazing furnace, oxygen and moisture paper trace of the child, can not form a magnesium protective atmosphere, so just exposed to the fresh aluminum oxide surface and immediately, if not removing the oxide film, it will not cause liquid solder wetting and flow. For the radiator, the radiator due to the relatively large surface area, the amount of gas adsorbed lot, in the heating process will be a lot of deflation, the vacuum was reduced. 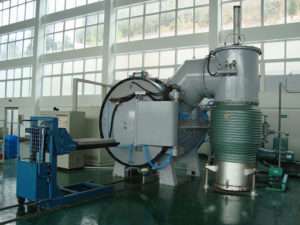 To Yasumasa vacuum brazing furnace, vacuum, and therefore must choose a larger pumping speed of the vacuum unit (pump rate: 5.0 × 10-4Pa atmosphere to no more than 30min) Al-Si-Mg solder melting point close to the melting point of aluminum , so its brazing temperature range is very narrow, generally between 595 ~ 615 ℃. As for the heat exchanger type structure is generally large size and spatial distribution are very uneven and mostly thin-walled material, and therefore requires uniformity of temperature vacuum brazing furnace heating zone is very strict, not more than ± 3 ℃ (space heaters, nine temperature), so the need for vacuum brazing furnace hot zone temperature control partition. Rain increase 200 ℃ oven. Incubated for 60 minutes. Vacuum below 5 * 10-2.